Linlithgow Rugby Club organises and funds all of the local secondary school rugby as well as fielding two adult sides who play in the nationally organised leagues. In addition, the Club organises Tiny Reds for toddlers aged 2-5 and has 70 Micros (ages 5-7), 100 Minis (Primary 4-7) and 80 Secondary School players. 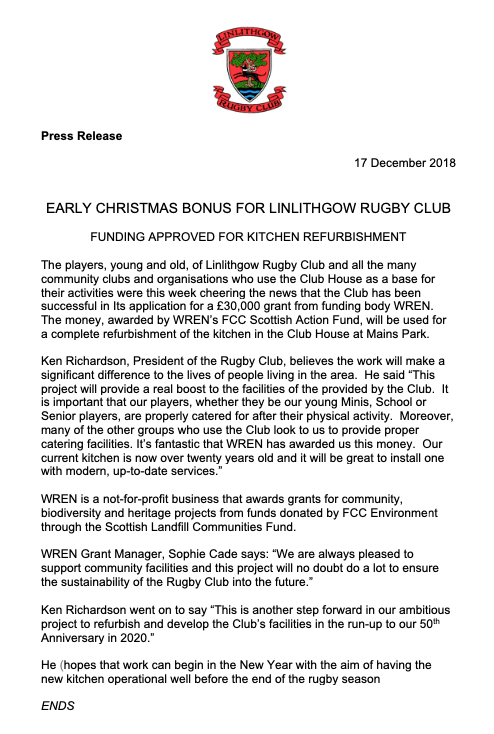 The Rugby Club also plays a major role in the life of the local community. It has staged the Town Fireworks Evening for over 25 years. It hosts both the Marquee, which is at the centre of the Town’s Civic Fortnight each summer, and the annual Round Table Fun Day where local groups and charities set out fund-raising stalls. A wide range of local community groups and clubs use the Club House as a community base for their activities.